With my kitchen in the middle of a major remodel, Erlend and I have been spending much of our summer grilling in the backyard. I've always thought that grilling was a fun novelty — something to do with a bunch of friends and a few glasses of cold beer on warm summer nights. 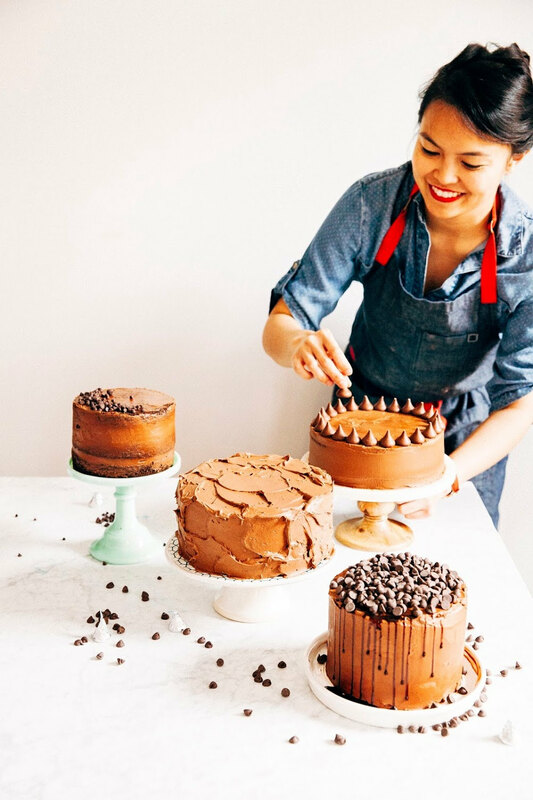 However, when you come to rely on it as your primary source of cooking, it quickly loses its charm, becoming too time-consuming and leaving all food with the same charred aftertaste. So when Erlend texted me to grab something to grill for dinner, I sighed. We'd been grilling meat and vegetables for nearly four weeks straight. I was sick of all the blackened chickens and sausages. I wanted something else — but what? I looked up from my phone and realized that I was standing in the seafood aisle of the supermarket. Erlend and I had tried grilling fish before, but without much success. Our various fish filets had always turned out too dry on account of our failure to preemptively soak a cedar plank for a few hours for the fish to grill on (because, yeah, apparently to grill a fish properly you have to grill it on a wooden plank — what gives? 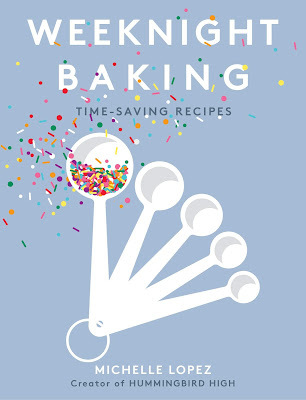 Who has time for that?). As I scanned the fish counter looking for inspiration, the fishmonger caught my eye. "It's hot out there today," he grinned. I shrugged noncommittally, but my aloofness didn't throw him off. "Perfect grilling weather. Are you looking for something to grill? Have you ever tried grilled oysters?" I raised my eyebrows and he beckoned me to come closer. "We just got a fresh shipment of Pacific oysters from the coast this morning," he whispered. "They melt in your mouth. Grilled to open, then topped with some butter and shallots? You're in for a treat." I looked at the pile of oysters he was pointing at. They did look fresh and inviting, with their outer grey shells glistening and shiny. As I came closer, I swear I could smell the ocean water on them. "They do look good," I finally admitted. "But I've never grilled oysters myself before." "No? I'm not surprised, not a whole lot of people have. But it's easier than eating them raw and trying to shuck them yourself. Shucking's a nightmare, but you don't even need to do that. You just throw the oysters over the fire, and they'll open up on their own." He grinned at me again. "What do you say?" "Get me a dozen," I said. Why not? It was something new, something different from the charred meat we'd had for dinner every night in the last four weeks. I mean, after all it was the middle of the summer — now was the best time to be spontaneous and make questionable life choices like buying a bunch of expensive delicacies to eat for dinner. When else was I going to be able to have the excuse to buy a bunch of oysters and then grill them? "What'd you get for dinner?" Erlend said, as I arrived home. He gave me a look. "Oysters. Really. Have you ever tried shucking them? They're a huge pain to open!" "Not necessarily," I hastily explained the fishmonger's description of grilled oysters. He gave me an amused look and helped himself to one of the Bud Light Limes I'd also picked up at the supermarket. "Well, let's hope you didn't get played by that dude. Guess we'll find out soon enough." I scowled behind his back and made plans to secretly look up grilled oyster recipes. My fear of being taken as a fool by the fishmonger was unfounded, however. Several of the recipes I found online instructed me to prepare them in the way that he had suggested. Later that evening, Erlend and I stood over the grill and stared at the oysters we'd placed over the fire. After five minutes on the grill, almost all of the dozen oysters had popped open a quarter of an inch and were glistening at us through the smoke, as if challenged. Erlend carefully plucked them out of the fire and gently pried one open. I handed him the champagne mignonette I'd made earlier in the afternoon, and watched as he spooned it over the oyster. He popped it into his mouth. I grinned, took an oyster for myself, splashed a generous amount of champagne mignonette over it, and popped it into my mouth. The fishmonger was right. Grilled oysters were heaven. The grill had imparted a smoky, toasted flavor onto the oysters that was unique and different from the grilled meat and veggies we'd been having for the last month — it was almost like I was eating a creamy, smoky slice of the sea. Additionally, the champagne mignonette, which I'd refrigerated earlier to thicken, added a tart and cool contrast to the toasty oyster. 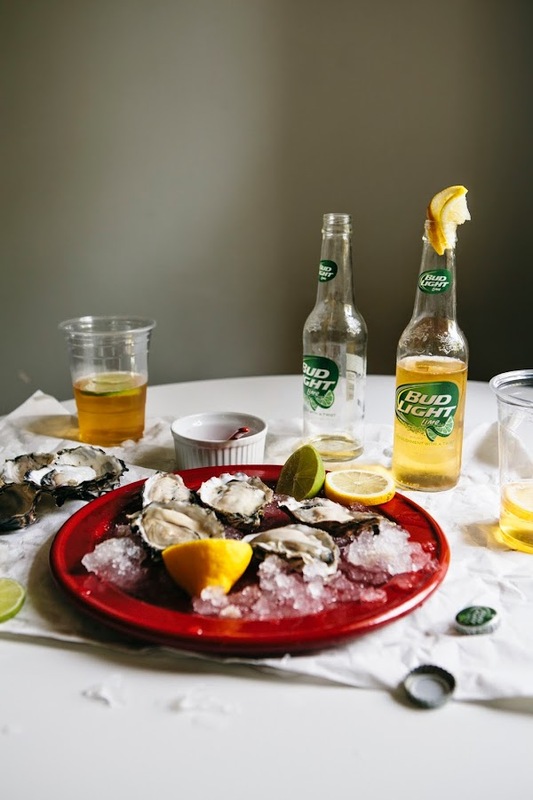 We both helped ourselves to more oysters, complemented by another Bud Light Lime. I'd spontaneously placed lemon and lime slices in both our cups, providing our smoky seafood meal the refreshing break that it needed. "Why didn't we think of grilling oysters earlier?" Erlend finally said, as we simultaneously picked up the remaining two oysters from the plate. "Beats me," I shrugged. "But we should do this every summer. 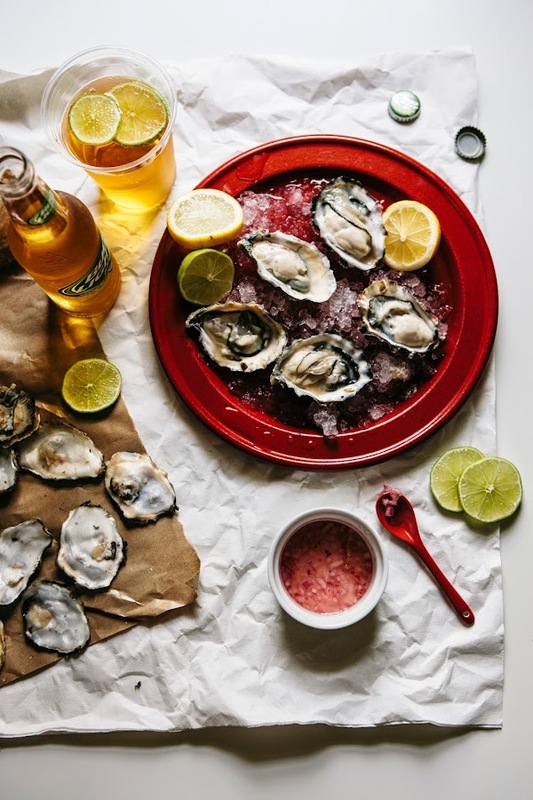 A night dedicated to eating nothing but grilled oysters and citrus beer." "I'd be up for that." 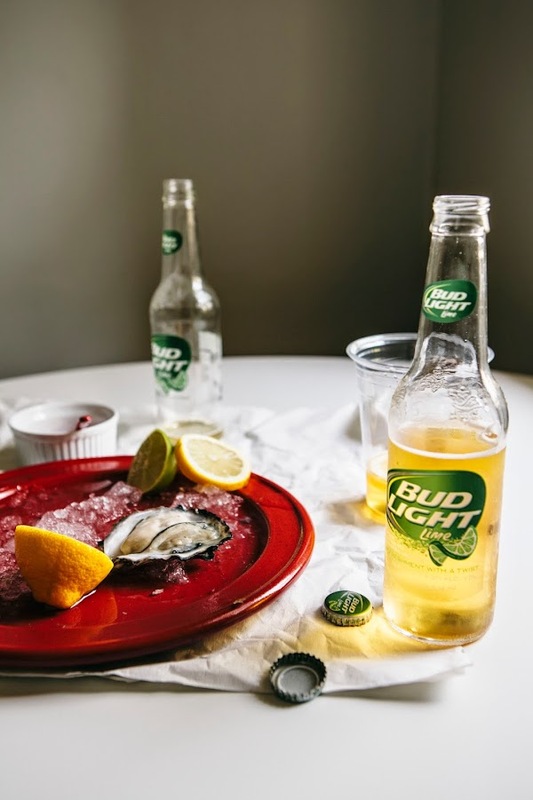 This post was sponsored by Bud Light Lime, who graciously provided the beverages for me and Erlend's spontaneous oysterfest! 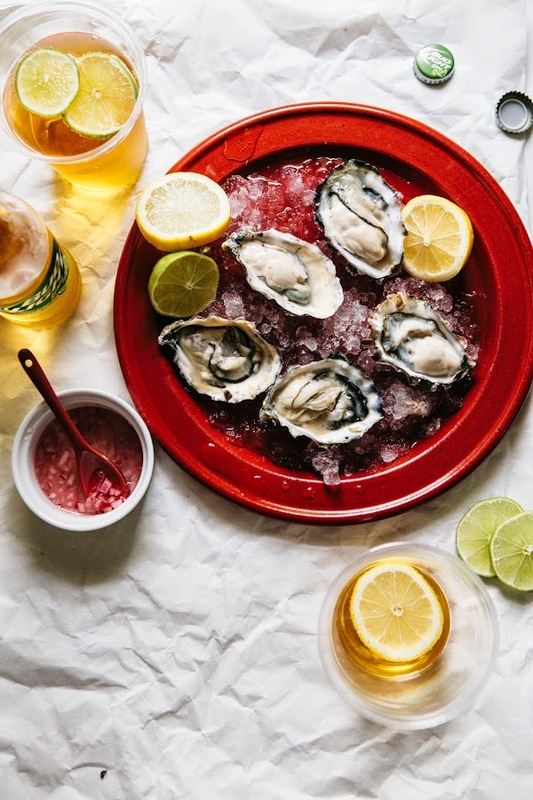 Oysters and other high-quality seafood is available at Whole Foods' supermarkets at relatively affordable prices; I believe I paid $1.30 per oyster, which is quite a steal considering some of my favorite restaurants around town charge anywhere between $3 to $5 per shell. Whole Foods fishmongers will even shuck them for you for free, should you wish to consume them raw (which is what Erlend and I did the next day after our grilled oysterfest, because we're ridiculous like that). 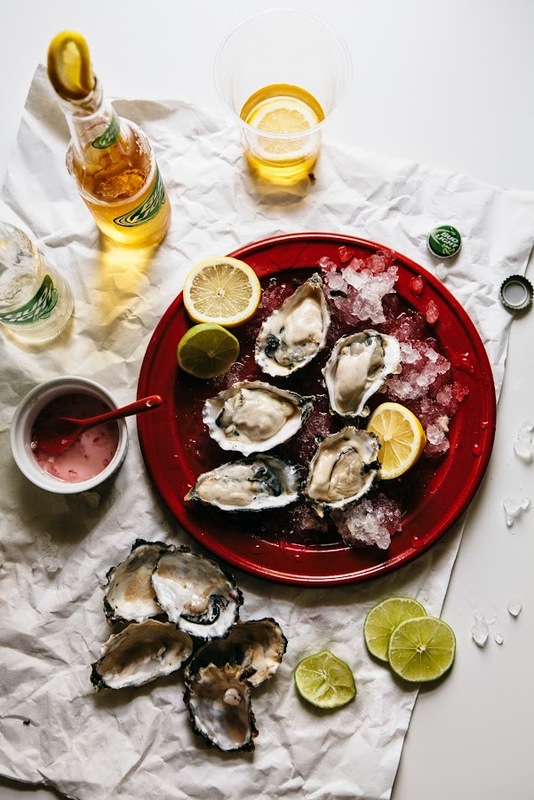 Oysters should be refrigerated out of water, since they will open and consume available oxygen if refrigerated in water. In order to not get sick, oysters must be eaten or cooked alive. How do you tell if an oyster is alive? Live oysters snap to a close if tapped lightly on its outer shell. If the shell stays open, the oyster is dead, and therefore cannot be eaten safely. In this particular recipe, cooking oysters in their shells kills them and causes them to open by themselves. If the oysters do not open even after cooked, you can assume that they had died before cooking and is unsafe to eat. First, make the champagne mignonette. It's best to make the mignonette a few hours before you are going to grill the oysters to allow it to cool and thicken appropriately. In a small bowl, combine 2 tablespoons champagne vinegar, 2 teaspoons finely chopped red onions, 1/4 teaspoon extra virgin olive oil, a pinch of granulated sugar, a pinch of coarse black pepper and a pinch of kosher salt. Gently stir ingredients together, before covering with plastic wrap and allowing to chill in the fridge for at least 2 hours. 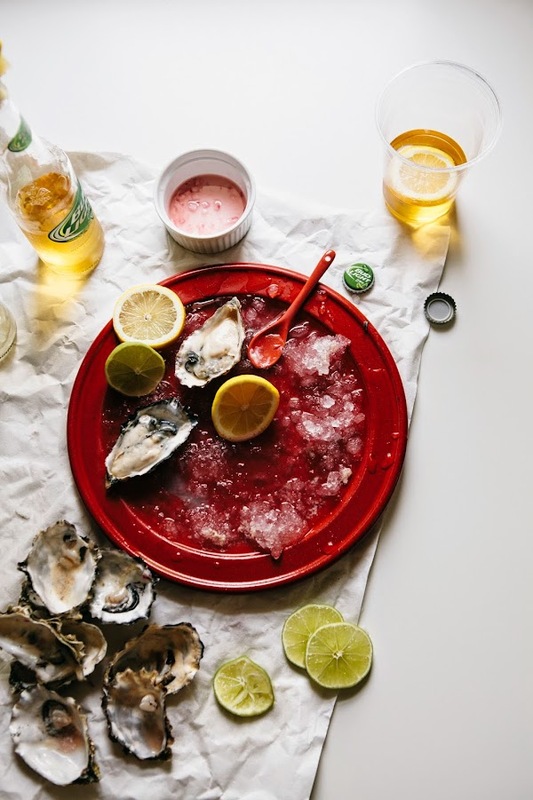 Once the champagne mignonette is ready, prepare your oysters. Prepare a grill for medium-high heat. 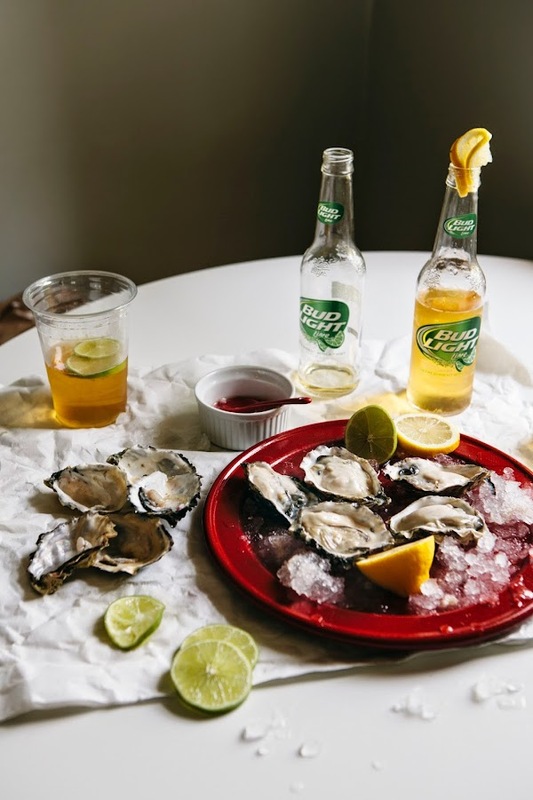 Place each oyster cupped side down on grate, cover grill, and grill until oysters begin to open. The oysters can take anywhere between 2 to 5 minutes, and will likely pop open only a quarter of an inch or less. Transfer opened oysters to a platter, making sure to discard any that do not open. 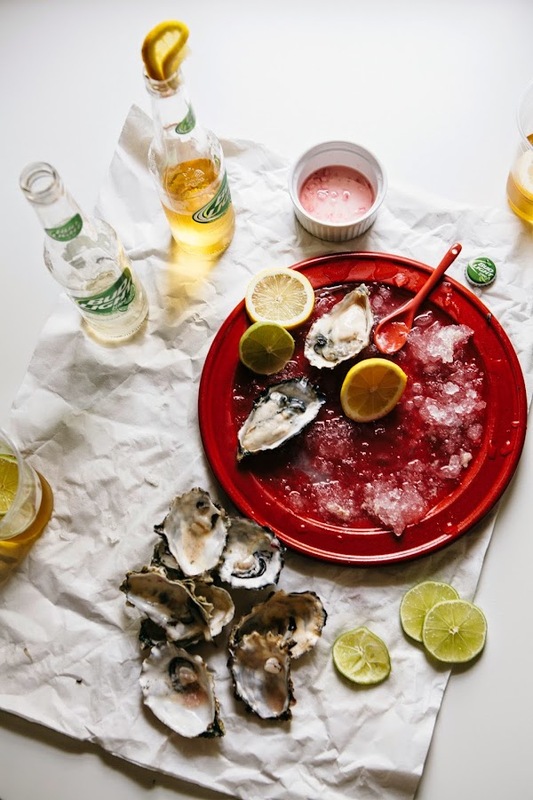 Let cool slightly (having a bed of ice to cool the oysters on allows you to handle the hot shells more easily), then use a short, blunt knife to pry the shells fully open, keeping cupped side down and retaining as much liquid as possible. 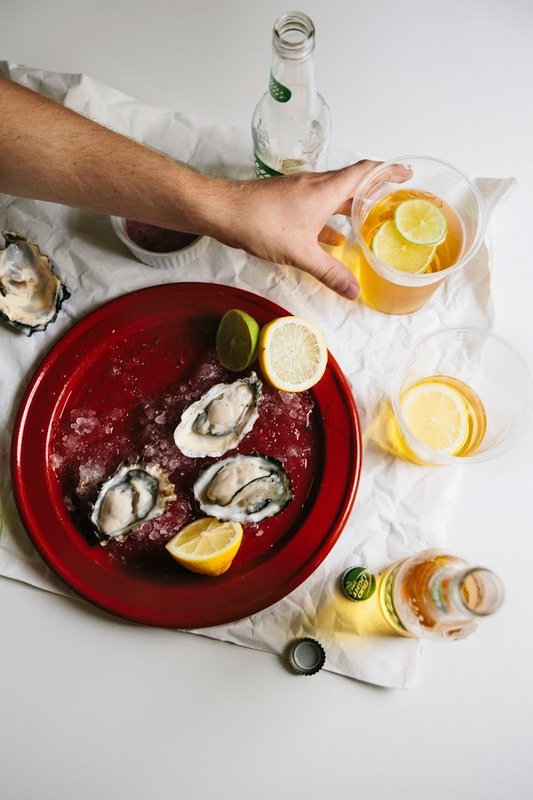 Use a paring knife to cut the muscles connecting oysters to shells. Serve immediately. What a wonderfully fun and unique summer party idea!! I have never thought to grill oysters. So delicious!!! We love grilling oysters. Topped with hot sauce, white wine, garlic and lemon juice. Or shucked and coated in hot sauce and panko then pan fried. So good. Hummm, todo un festín de olores y sabores!!! "... it was almost like I was eating a creamy, smoky slice of the sea." Amazing. That sentence alone makes me want to hustle down to the fish market. I had oysters raw once and I thought they tasted like a bland object drenched in sea water. I'll have to try grilling them next time! I've actually never had oysters because the texture is a bit intimidating to me, but these look really, really good!! Ohhhhhmagoodness...this loooks soooo good! Oyster is one of the best things to ever walk (swim?) this earth and I fell in love with them even more when I had them grilled once! They're good in any form but grilled or in super spicy Korean kimchi is the best! Have you tried them in kimchi seasoning? You must. I'm smitten you've shared such marvelous photos and two easy ways to open those oysters... Grilling them or making Whole Foods do the work!